Poetry is a life-cherishing force. For poems are not words, after all, but fires for the cold, ropes let down for the lost, something as necessary as bread in the pockets of the hungry. – Rodger Housden – 10 Poems to Open Your Heart. 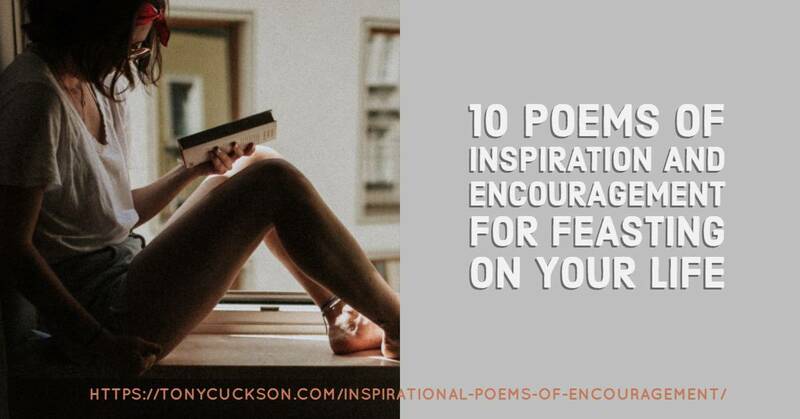 Welcome to Part II of 10 Poems for Encouragement and Inspiration. In the first part we shared the following inspirational and uplifting poems by various poets from different time and places. This included video and audio to enhance the experience via listening. I choose to divide these 10 poems of encouragement into two parts so that you might enjoy too bites of the cherry rather than one. Below are shared the remaining five poems of inspiration and encouragement. These include video and audio that I hope enhances the listening experience. This is a poem that shares with you the invitation to “feast on your life.” This will be your experience when you meet again the One who has loved you all your life. This is the One that is not separate from you – ever has been separate from you – ever will be separate from you. The quest of being human is to know this directly and not something to believe in. A mere belief is the practice of building you house on the shifting sands of time. This is not the rock of KNOWING beyond the limitation of the intellect and the identification with the personal. The Alchemist is the one who has learned to turn lead into gold. You are the one who, on the journey of spiritual growth awaken the Alchemist within. This is the Presence within you, the Secret of Secrets that knows how to transform the lead of the separate self into the Gold of the true Self. This is not something you do. It is that you allow it to be done to you. It is the letting go into the experience of real faith. Faith is the willingness to go into the unknown. Those who have been alchemised will encouraged to take this leap of faith where you will meet again the stranger who has loved you all your life. Here is my favourite poem by the Irish poem Patrick Kavanagh. This is where you are invited to allow your soul to take wing. This poem shares the journey of the first stage of life where you are required to explore success and failure within the world of time. In the second half of life you realize (I hope you realize) that you need to be free to be true to who you are created to become. Offered for sale in twenty fairs. Were little men who feared his unusual airs. What I’d brought for sale. To shape him for another fair. But not for high-paid work in towns. He’d do a tinker, possibly. A soul is a poor man’s tragedy. With my horse, my soul. Of Church and State and meanest trade. Never again will it go on. There is grazing of the sun. Every land my imagination knew. No top ten selection of poems inviting you to Companion YOUR Greatness could ever be complete without including a poem from the modern mystic poet Mary Oliver. Here is a poem that reminds us, once again of the importance of Love. Here is the quintessential poem about the experience of spiritual awakening and what one must do in order to allow it to be re-experienced. It is to be able to give up who you think you are in order to allow the Secret of Secrets to be inside you again. The poet speaks of possession this field of grace but it is more that you learn to allow this Field of Infinite Presence to possess you which it always does. It is being possessed by the Timelessness of Love. These poems come from different times, cultures and traditions. They are all inviting you into an experience that is changeless and eternal. This is the KNOWING of the true Self. Most people take the Road More Travelled by which is the identification with the time bound false self – the mask – the persona. This is the major reason for most of the unnecessary suffering in the world. I hope these deep heart’s core invitations invite you to explore your becoming a true Companion of Greatness. Why not make reading or listening to sacred poetry part of the way in which you begin your day? This will change your energy because you are connecting with an energy that invites the highest good to come through you. In this way you companion greatness. It is after all who and why you are. If you enjoyed this sharing please vote by giving a star rating, sharing with others or leaving a comment or question.